Charmante maison de cinq chambres avec piscine, bain à remous, salle de jeux et foyer au bois. PAS DE PROMS! Nous n'offrons pas de check-in ou check-out le samedi. Les tarifs de fin de semaine sont du vendredi au dimanche (vous pouvez ajouter le jeudi ou le dimanche ou les deux). Les tarifs hebdomadaires sont du dimanche au dimanche ou du vendredi au vendredi. Séjour minimum de 4 nuits en semaine en été. Tous les adultes doivent être âgés de 25 ans au moins, à l'exception des enfants voyageant avec leurs parents. Nous avons besoin d'un bail signé et d'une copie de votre pièce d'identité. Les réservations de dernière minute nécessitent des informations supplémentaires. Notre charmante maison est située à quelques minutes de la montagne Camelback! Il dispose d'un salon avec foyer au bois ainsi que d'une salle familiale avec de nombreux jouets pour les enfants. La grande cuisine avec coin repas se trouve juste à côté de notre immense table à manger! La chambre principale au deuxième étage comprend un lit king-size, un dressing, un balcon et un berceau. La salle de jeux comprend une table de billard de 9 pieds, une table de casino et un espace bar avec un petit réfrigérateur. De la salle de jeux, vous pouvez sortir dans la véranda avec un bain à remous! Had a great weekend at this Beautiful house! Definitely would recommend this home to anyone! My family and myself had planned a Pocono weekend getaway for months. With two payment plans offered by the home owners and the rest of accommodations, we couldn't have asked for a better stay. We were super pleasantly surprised to have been greeted to a beautiful home, in a beautiful area, with towels and linen provided by the home owners. The house was warm/cozy upon arrival. We didn't run out of any necessities such as paper towels or toilet paper. Mind you, we were 17 people all together. We all had a bed to sleep on and were just absolutely cozy. The game room in the basement was an absolute success. I really recommend this home. The home owners were absolutely organized and everything was done in a timely manner. 10/10! To the home owners, thank you so much for everything! My extended family and I rented this house to celebrate my daughters first birthday. In the weeks leading up to our reservation, many negative reviews were posted. Concerned, we called numerous times to ask the property managers, All Poconos Rentals to address the problems. After numerous calls back and forth, we were assured all was taken care of. When we arrived, the outside of the house was filthy- with black stains all over it - front & back, like it hadn't been cleaned in years. The inside of the house was relatively functional, but left much to be desired. There were cobwebs in most corners, the sliding screen door was broken (hazard with two toddlers staying in the house), scrapes and dings all over the walls, broken couch and futon and there was a cockroach in the kitchen. The house also advertised to have two cribs (which is why we chose it), and they only had one (they did bring one for us after complaining). Overall, this house needs MANY updates and a thorough cleaning. While we were staying at the property the owners were responsive, but, since leaving, I have called three times and e-mailed twice about a partial refund and they have yet to respond to me. Shows you how they do business. I would not recommend this property or All Poconos Rentals. A very nice house for a group gathering. The property and house was very nice for a group gathering. We were 12 guys celebrating my friend's bachelor party. We were able to play lawn games in the backyard, BBQ, and enjoy the spacious interior for TV, video games, poker, and pool. The house was plenty large enough and comfortable for the 12 of us and all of our activities. Plenty of room for parking and overall a good experience. Central air kept the house at a very comfortable cool temperature. Of course, in summer humidity, the house was *very* buggy outside (lots of bugs and mosquitoes). So, you need to make sure you keep the doors shut. I would definitely recommend this house for other groups of 12. Our family of 12 had a very comfortable stay at this home. There was plenty of space for us to all be together at once such as around the dining table and fire pit and for us to spread out when we needed space from each other. The landlord was quick to respond any time we reached out. 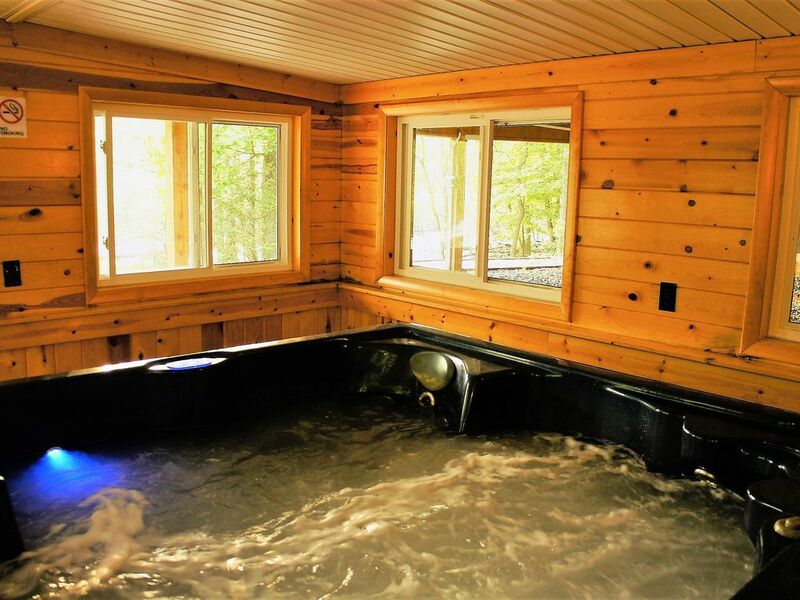 Be aware that if you are planning to use the bedrooms in the lower level, there is a very strong smell from the hot tub. Some of us with respiratory problems found it difficult to be in the lower level at any time, let alone sleep there. Fortunately, we were able to sleep on the pull out sofa and the sectional. We had a great time at your home even though the weather was crappy.the home is very spacious and well kept.plenty of room for everyone.and toys fi ef the children.will definitely go back again. Notre maison est située à quelques minutes des parcs Camelback / Camelbeach et Crossings Premium Outlets. Nous sommes à moins de 25 minutes du Mount Airy Casino et du Kalahari Indoor Water Park. Nous sommes également à quelques minutes des magasins, des bars et des restaurants.